Perhaps you’ve experienced a high-octane romance that began with heightened expectations but inexplicably ended on the scrap heap? Like Ravel‘s musical masterpiece Bolero, the romantic cadence may have soared to an exhilarating crescendo. Only in your love song, the orchestra hit some sour notes and the relationship’s rhythm was shattered beyond repair. Astrologer Paul Westran has a tested theory about relationships that unfold in this way. In a rigorous, eight year study involving 1,300 couples, he examined the correlations between planetary alignments and real events in people’s lives and came up with some surprising results. Curiously, Westran’s research failed to support the popular idea that certain sun signs are more compatible (with each other) than others. But he did find evidence that Venus, the planet astrologers have traditionally identified with the principle of attraction, appears to impact personal relationships in predictable ways. His research supports the idea that angular alignments between planets, what astrologers call aspects, appear to work the way astrologers say they should. He also found statistical support for the method astrologers call synastry, which compares the angular alignments between planets in compared natal birth charts or horoscopes. Most commonly, this technique is used to evaluate compatibility potential between couples. ›› Astrological compatibility reports can offer insight into how the planets play out in your relationships. Surprisingly, Westran also showed that planets that are progressed or moved ahead using the technique astrologers call “secondary progressions” are significantly more involved at the start-up of relationships than previously suspected. [ad]In the study, favorable aspects between the sun and Venus turned up in the compared synastry charts of couples a lot more frequently than expected by chance. This was an important finding for astrology, but Westran had other questions. For example, is there a better astrological explanation for why intensity levels in relationships tend to wax and wane the way they do? Can astrologers more accurately determine not only who might be attracted to whom but how the relationship might progress over time? What role, if any, do progressed planets play in the unfolding drama? Normally, secondary progressions are used to help time events in individual birth charts. Astrologers calculate how far the sun, moon and planets have progressed around the horoscope wheel using a day-for-a-year formula. For every year that passes, planets in the progressed horoscope are advanced the number of degrees they have actually traveled in a single day, either forward or backwards (if retrograde). To find how far planets have progressed by age 30, the astrologer simply counts forward 30 days from the date of birth and casts a chart for that day. In a progressed chart, the sun advances about one degree per day, but the progress of the moon and planets is uneven, with planets closer to the sun in tighter orbits typically moving around the wheel more swiftly. In this race, Mercury and Venus are usually “track stars” when compared with foot-dragging Jupiter and Saturn. And the earth-orbiting moon moves with lightning quickness. Westran believes the major finding emerging from his study is that progressed synastry aspects are powerful indicators of how relationships will evolve over time. He likens natal synastry to a photograph or a message fixed in time. Progressed synastry aspects are more like a movie with a beginning, middle and definable end. In a couple’s natal synastry chart, Venus may not be forming a major aspect with the sun. But this may no longer be the case 30 years later when the couple meets for the first time. With progressed synastry, aspects can be observed dynamically forming, conjoining and subsequently moving out of orb (outside their range of influence) at the end. In his study, Westran was able to show that progressing synastry aspects dynamically reflect or correspond with romantic developments in the lives of real people. From his home in Perth, Australia, Westran runs a successful astrological consultancy with clients on four continents. He is a former crime analyst and forensic software expert and explains that the astrological research activity began as “exploratory analysis.” Almost immediately, Sun/Venus aspects stood out and were showing up between progressed horoscopes with great regularity as well. For the research, Westran needed accurate birth data and confirmable biographical information. The only option was to use public figures and celebrities, which meant relying extensively on well researched products like the AstroDatabank celebrity database. However, each personal history needed to be carefully checked before trying to determine whether the astrology agreed with the couples’ personal stories or not. At first, he created research matrices and counted aspects manually but eventually developed software to calculate the aspects. However, for years it was a laborious manual process. The major aspects astrologers consider are the conjunction, which occurs when celestial bodies are closely aligned in the same sign, and the opposition, which occurs when planets are roughly 180 degrees apart in opposite signs. Also considered are the compatible 120 degree trine, the stressful 90 degree square, and, to a lesser extent, the helpful 60 degree sextile. Among the progressed synastry aspects considered in Westran’s study were natal sun and natal Venus, natal sun and progressed Venus, progressed sun and natal Venus, and progressed sun and progressed Venus. Convincingly, the study confirmed that sun/Venus synastry aspects, both natal and progressed, turned up more frequently than expected at the start of relationships. When taking into account all of the possible sun/Venus synastry connections, the odds that positive synastry aspects would turn up as often as they did at the start of relationships were 900,000 to one against chance, or substantially greater than needed to demonstrate statistical significance. Although less impressively, certain synastry alignments of Venus with Venus and Venus with Mars presented at the start of relationships with statistical significance as well. Based on a careful evaluation of every natal and progressed synastry chart collected, Westran is convinced that progressed synastry aspects are more powerful and intense than natal synastry aspects. In arriving at this conclusion he was aided by the unique format he created to graphically illustrate and track progressing synastry aspects. In his book, When Stars Collide, the author presents page after page of documented case studies and uses what he calls “collision charts” to dynamically show correlations between progressed synastry aspects and events unfolding in the lives of real people. For example, Westran says Prince Charles and Diana had a “hugely illustrative” set of progressed synastry aspects working during their time together, including the example above which shows Charles’ progressing Venus forming a trine to Diana’s progressing sun. The aspect helped define the early years of the relationship, but the storybook romance started to unravel after the progressed aspect became exact and started to wane. The marriage was officially over by the time it was no longer operative (in orb). The newest Royal couple, William and Kate, caught a celestial break with a rare, long-lived progressed synastry trine aspect involving Kate’s progressed Venus and William’s natal Venus. The aspect is long-lived because Kate’s progressed Venus was retrograde (traveling backwards in the heavens from our earth-bound point of view) when then couple met in 2000, and only began moving slowly forward in 2004. At its current pace, the progressed synastry aspect will not separate until 2030, at which time the couple will be able to rely upon other helpful aspects in both their natal and progressed synastry charts. Westran believes progressed aspects provide a fertile field for future research efforts. For example, a promising new study looks at dynamic connections between the sun and Mars in the progressed charts of world leaders. Historically, the years 1922 and 1949 were significant for Stalin and Mao because they came to power in the USSR and China as progressed Mars advanced to form a conjunction with their natal sun. But a Mars/sun connection also was in play when Churchill, Truman, both Castro brothers, Mussolini and others came to power in their respective countries. How does Venus affect your romantic choices? Let us know in comments below. Additional tables and charts specifically related to this article are posted at www.positiveastrology.com/ANS.asp. 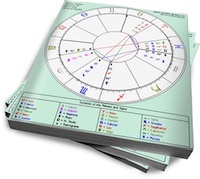 On the www.positiveastrology.com website, visitors can access a database that will enable them to produce their own progressed and natal synastry reports. Secondary Progressions were possibly first alluded to by Johannes Kepler, but described in detail by Placidus de Titus in his book Primum Mobile in 1657. Placidus was influenced by Kepler and he referred to quintiles in his work, as aspect which was introduced by Kepler. Henry Coley quotes Placidus’ method of progressions being used in about 1690. Secondary progressions were so named by Placidus because he regarded another (much more complex) method known as Primary Directions to be the pre-eminent way to advance a birth chart and that his method was simply an adjunct to use as a check after having directed the chart. What this means is that we know more-or-less where secondary progressions originated; however we can be less certain about the other earlier methods of direction and progression which came down from antiquity. What this tells us is that Secondary progressions are likely to have been studied a little prior to their acceptance while the earlier methods are likely to have been accepted as received wisdom by later astrologers. While Kepler had a collection of 800 horoscopes, we can’t be certain that any astrologers prior to the 20th Century did any scientific experimentation with large enough data samples to derive good rules of thumb. We also know that none had databases able to create data models and graphic depictions of astrological patterns. We are still waiting for a study of Primary Directions that will allow them to earn the pre-eminence ascribed by Placidus and those admirers of his that followed. As it stands the far simpler and more intuitively fractal-like Secondaries occupy this position both in experimental astrology and in common practice. There is an astrological rule introduced by Charles Carter which states that “no direction (or – we assume – progression) can bring to pass what is not shown in the nativity”. This is absolutely not the case for secondary progressions and this is evidenced over and over again in the cases featured in When Stars Collide. Robert Blaschke, Astrology: A Language of Life Volume I – Progressions, Earthwalk School of Astrology, 1997 includes a section on Synastric Progressions. Robert Blaschke, Astrology: A Language of Life Volume IV – Relationship Analysis, Earthwalk School of Astrology, 2004, expands upon this earlier section. Paul Westran, When Stars Collide Why we love who we love and when we love them, O Books, 2006 – this book is the first dedicated solely to progressed synastry and details the scientific nature of progressed synastry aspects using a study of 1300 public record relationships. It introduced the collision graph. Paul Westran, Why Do Lovers Break Each Others Hearts? The Mountain Astrologer, September/October 2003 introduced the progressed synastry matrix. Paul Westran, Reclaiming the Mars Effect for Astrology. The Mountain Astrologer, Mercury Direct, August/September 2010 introduced the idea that progressions solve problems raised by Gauquelin’s Mars Effect. This article is republished by permission of the author and originally appeared at Astrology News Service (ANS). Edward Snow is managing editor of the Astrology News Service (ANS). He is a former news reporter and publicist who has managed PR programs for national and regional clients. He has been a student of astrology for many years. On astro.com there is the option to view your ‘natal chart and progressed chart combined’ or to just view your ‘progressed chart’. When I look at both the progressed planets are different in each of them even though its for the same day. I will have planets in completely different houses when I look at them differently. How do I find an accurate chart that shows current progressions? Yes, I figured it out. The biwheel had threw me off! Thanks! If progressed synastry is so important, that would explain why Saturn aspects in natal synastry are supposed to indicate long lasting relationships: Saturn moves so slowly that it would keep the aspect in orb and alive (if progressed) for two centuries and still it is not a generational planet. Yes great research..I have seen this in many charts between couples where prog Sun to natal Venus conj is at work at the start of major relationships including my own!It also coincided with a midlife Neptune sq Neptune transit at 28degs Scorp/Aqua (I had first met this person 28yrs previously) where he had actively pursued me the entire time while I completely ignored him (he has Moon/Sun cazimi Mars in Leo conj..he loved the chase)Until my prog Sun was within 2deg orb of my natal Leo Venus I surrendered.Then when it was exact the physical aspect of the relationship was over..but manifested in a Leo child born on the same day/date as his father.My son has natal Venus/Sun conj in Leo and has more charm than Cassanova himself.My own experience with my chart has helped me to help others understand the complexities of our relationships thru astrology.I love it and feel very blessed with this powerful knowledge.